What is metabolic syndrome and how is it treated? Metabolic syndrome in the last ten years has assumed epidemic proportions across the globe. It is estimated that today one third of the world's population suffers from obesity. In Europe the problem are facing more than half of the adult population and which is particularly discouraging is the fact that more and more children struggle with this problem. In doing so, obese men live an average of 12, and women nine years less than people with optimal body weight. What exactly is metabolic syndrome, and how much a danger to overall health it presents and how to treat it? The answers to these questions are in this article. What are the main causes for the occurrence of metabolic diseases? Take a look around, you will notice a lot of obese people - how many are there? Probably a lot, do not doubt it. The metabolic syndrome is largely caused by unhealthy life. There are also genetic predispositions, which may also not be ignored. Seemingly harmless fat around the waist causes a metabolic disorder of carbohydrate and fat. Reduces the sensitivity of cells to insulin and increases the risk of diabetes and heart disease. All this together is characterized by metabolic syndrome. Many people who are overweight are viewed exclusively as an aesthetic problem and not otherwise. However, weight gain, especially around the waist is the main trigger for metabolic diseases. 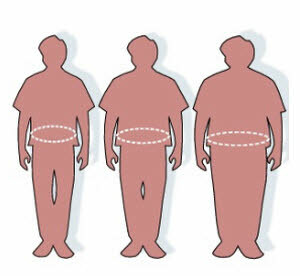 In addition to a different reflection in the mirror - the excess abdominal fat can lead to many health problems. In addition to reducing the sensitivity of cells to insulin and increases the risk for type 2 diabetes, obesity contributes greatly to the emergence of diseases. In the first place you have hypertension and ischemic heart disease. Each new kilogram increases the risk of cardiovascular disease by as much as 3.1 percent. If you have three or more disorders from the list, you definitely suffer from metabolic syndrome. Obesity (especially around the waist). The increased LDL and decreased HDL cholesterol. If the waist size in men is greater than 94 cm, and in women more than 80 cm, the risks of so-called syndrome X has a multiple increase. In this case fats have already accumulated in the stomach area and around the internal organs, which is extremely dangerous. These fats are metabolically active, and in the blood are ejected substances that contribute to the occurrence of metabolic disorders of carbohydrates and fats. All of this is a prerequisite for metabolic syndrome, a condition which is the basis of many different disorders. For it indicates insulin resistance, abdominal fat, high blood fat and blood sugar, and high blood pressure. Given that their cells are resistant to insulin, people with metabolic syndrome often suffer from diabetes. The risk of diabetes for them is as much as 20 times higher. Prerequisites for the emergence of serious cardiovascular disease also exist. Heart diseases are even two to four times more present. If you have to obesity and have elevated triglyceride levels (above 1.7 nmol / L) then call your doctor. In addition to measuring the waist, always inspect your BMI (body mass index). In addition to regular physical activity, metabolism can be accelerated with proper nutrition. Meals cannot be skipped during the day. Give preference to fresh fruits and vegetables, with the addition of legumes and whole grains. These foods are rich in fibre, which means that it enhances digestion. In addition, they reduce appetite and metabolism, thus leading to weight loss. Important Note: Stop smoking! Cigarettes contribute significantly to the worsening of conditions in the metabolic syndrome and often cause greater consequences. Blueberries are especially recommended since they are rich in antioxidants. They increase the sensitivity of cells to insulin, which reduces blood sugar level. However, before reaching for food, drink a glass of water in sips. Very often we think that we feel hunger, but actually we just thirsty. Metabolic syndrome can be kept under control with proper food choices. It speeds up the metabolism, improves the sensitivity of cells to insulin and burns fat. It is mandatory to add the stews, soups and other dishes as a condiment. Drink before bedtime every night cup of low-fat milk mixed with half a teaspoon of gold dust. A mixture of 20 g of fir needles, 50g of grated ginger root and 2 tablespoons of turmeric pour half a litre of red wine. Heat the mixture to boiling, remove from heat, cover and leave it to stand. Keep three days in a dark, cool place. Then strain and leave in the fridge. Take 25 ml of each day after breakfast and lunch. It is used in the treatment of diabetes, and can help when metabolic syndrome occurs. Is successfully melts excess weight. Its leaves are seasoned with a little lemon juice and can be used as a light salad. Chewing the stems will reduce blood sugar levels. If you prefer to drink tea from the leaves of dandelion, create it as follows. 15 g of leaves pour with a cup of boiling water and strain after 15 minutes. Three times a day drink, after a cup of tea half an hour before meals. For metabolic syndrome, effective is tincture of dandelion. 60 g of root is poured with a litre of home-made liquor. It should stand for two weeks in a dark, cool place. Then strain it, and taken three times a day 25 drops diluted in a glass of water. One tea blend with dandelion also helps. You can mix 50 g of couch grass, leaf and flower and yarrow leaves and dandelion root. One tablespoon of the mixture is poured with 200 ml of boiling water and strained after 15 minutes. Drink 30 ml of tea in the morning on an empty stomach. The treatment lasts for two weeks and can be repeated after a ten-day break. Tea made from corn silk can also help with overweight problems, which reduces appetite and speeds up the metabolism of fat and sugar. Tea can be made with 3 tablespoons of corn silk which is poured with a litre of boiling water and strained after half an hour. Beverage is consumed during the day in small sips, the best choice instead of water. In the treatment of metabolic syndrome it is necessary to speed up the metabolism of fats and carbohydrates, which is influenced by many herbal teas and mixtures. We will share a few exceptional recipes. 30 g of fireweed cover with 500 ml of boiling water. Strain after half an hour and drink four times a day by 70 ml before meals. 15 g of plant is poured with 200 mL of boiling water. Drink four times a day 50 ml before meals. 70 g of above ground part pour with a litre of boiling water. After two hours strain and drink three times a day 70 ml half an hour before meals. Some herbalists recommend tea and dried leaf plantain for metabolic syndrome. Specifically, 1 teaspoon of herb is poured with a full cup of water (boiled). After half an hour, spun, and drink three times a day half a cup. Related: How to use plantain with honey? Metabolic syndrome can be kept under control with the usage of different tea blends. Mix 100 g of chamomile flowers, above ground parts of knotweed grass, leaves and flower of St. John's wort, immortelle and buds of birch. Two tablespoons of mixture is poured with 5 dl of boiling water, cover and leave to stand for twenty minutes. Then strain it well. This tea improves metabolism and accelerates the expulsion of harmful fat from the body. It is drunk every day, 2.5 dl in the morning half an hour before breakfast and 2.5 dl at bedtime. The treatment lasts one month and should be carried out once every three years. Metabolic syndrome causes many health problems. In order to stop them it is necessary to regularly drink green tea. He proved effective in melting fat, increases metabolism and lowers blood cholesterol. The studies that are now carried out on animals show its many positive effects. It provides good protection against diabetes. It is enough to drink three cups of green tea a day, but its effect can be enhanced by the addition of ginger. Just add half a teaspoon in a cup of tea. Mix 25 g of fenugreek seed, 25 g of pods of beans, 20 g of nettle leaf, mulberry leaf 20 g, 5 g of sage and 5 g of dandelion root. One tablespoon of the mixture pour in a cup of boiling water and strain after an hour. Drink one cup three times a day before meals. If you metabolic syndrome complicates life, make this tea mixture. Mix 20 g of everlasting, two-pronged, strawberry leaves and corn silk. Two tablespoons of tea pour over with 500 ml of boiling water and let it stand for an hour, strain and drink 150 ml three times a day before meals. Mix 50 g of dandelion root, leaf of common motherwort, Coltsfoot, blueberry leaf, birch leaf, celery and green beans. One tablespoon of the mixture is poured in a cup of boiling water and let it settle for two hours. Strain and drink three times a day one cup. As you can see for metabolic syndrome we indicated to you over 15 natural recipes in this article. If you want to learn how to speed up your metabolism without drugs, read the following text.